I wanted to learn more. 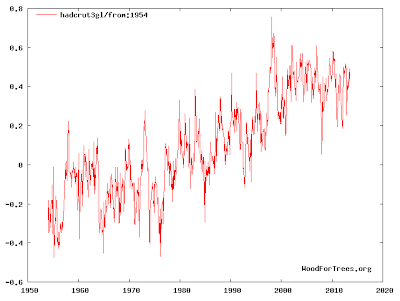 The story told us that the earth is going to warm (no surprise there), it quotes two government scientists that praise the study (no surprise there), and a little about the study's methodology. After reading the CWG story and parts of the study itself, I found things didn't add up. Let's call the study which forecasts more tornadoes the "Diffenbaugh study" after its lead author. 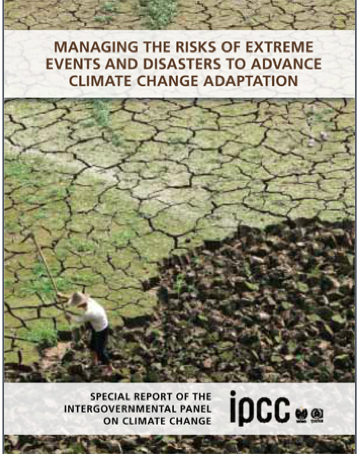 There is now considerable evidence that the occurrence and intensity of climate extremes have been increasing in recent decades, and that continued global warming likely will amplify these changes (1). For those unfamiliar with scientific papers, the "(1)" is a footnote referring to another scientific study. In this case an IPCC study that was published last December. In what universe does "considerable evidence" in the context of a study about tornadoes and severe thunderstorm trends equate to "there is low confidence in observed trends in...tornadoes and hail"? Why is this important? The Diffenbaugh study is based on, at best, a flawed premise and, at worse, a false premise. 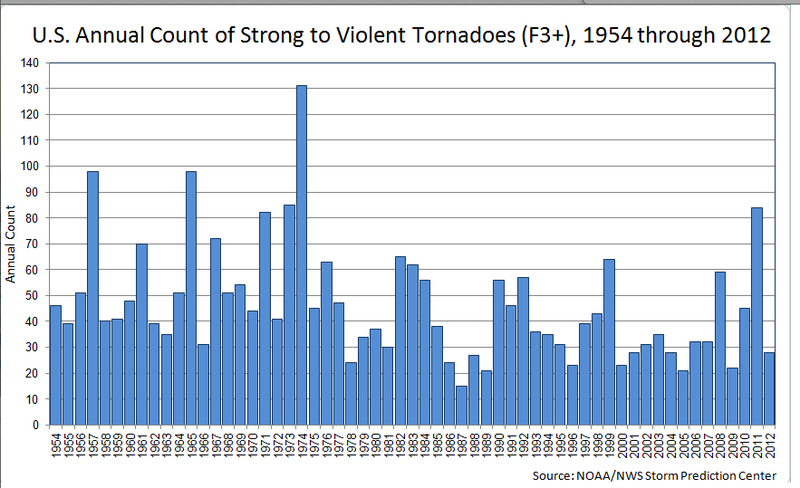 Even though temperatures have warmed in the last 60 years, there is no upward trend in violent tornadoes. 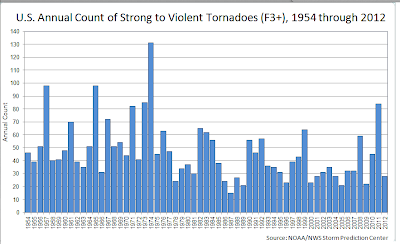 Here is the National Weather Service's plot of violent tornadoes since 1954. There is no upward trend in violent tornadoes. If anything, there were more violent tornadoes when temperatures were cooler! Yet, because a computer model says so, we are to believe that tornadoes and severe thunderstorms will be worse in the future because temperatures are forecast to rise even though rising temperatures, thus far, have not produced that result and -- perhaps -- the opposite result. In science, nothing is supposed to be taken for granted. Skepticism is to be rewarded as it is part of the scientific method. Yet, the scientific method is too often given a pass when it comes to climate "science." The Diffenbaugh study and the CWG story, unfortunately, are yet another example. Want to Learn More About Tornadoes? 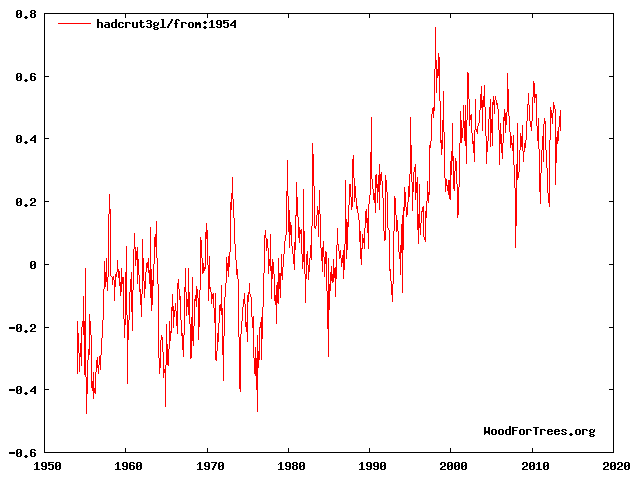 Why Does the IPCC Leak Its Findings? "The Sun That Did Not Roar"
A Very Nice Day in Most of U.S.
What's My Line? Flying Near Tornadoes. Worst 24 Hours in "Global Warming" History? "It's Ice, Ice, and More Ice"